An Early Childhood Development Centre is a facility that offers education and care to children of 0-6 years. These can be Edu-Care centres run in churches, community halls, homes, or even under trees. 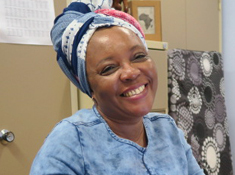 PHAKAMISA runs an ECD training programme, based at Pinetown Methodist Church with our workshops providing practical training and hands-on follow-up visits from our trained monitors. Our students are all from very impoverished communities and have had an inferior education themselves. Edu-Care Course – 1-year training for educators teaching children from 3-6 years old. Supervisor Course – a 6-week course to help develop skills of those running ECD Centres. Level 4 (SA government registered qualification) – which develops to a higher level the facilitation and monitoring of the development of babies, toddlers and young children, and provides a basis for further professional development for the qualified practitioner. The Level 4 training is taught by Cathy, with students producing 4-5 assessments weekly, and the qualification takes 2 years plus to complete. Phakamisa courses cover all the necessary concepts required to provide a sound foundation for formal education. Rhythm, rhyme, music, games, story telling, creative play, active learning, respect & care, are integral parts of the courses. 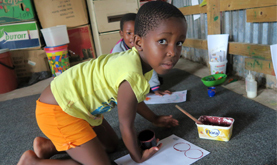 Manufactured equipment – such as storybooks, jigsaws, puzzles, games, and toys – are too expensive for most Educare Centres unless they have been fortunate enough to receive donations of second-hand items at PHAKAMISA. So students learn how to create teaching aids, games, puzzles and musical instruments from waste. We collect and use cereal packets, boxes, plastic cartons, bottles, etc, to make them. Over the past 20 years we have trained over 4,000 Educare teachers. 10,000 children benefit directly from our Educare programme. These children would otherwise not be adequately prepared for formal education. 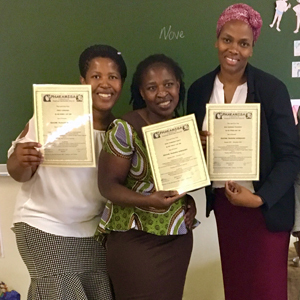 This year, Phakamisa began a course for a government recognised early childhood development course – Level 4 and have 7 of our Educare graduates working through the content and taught by Cathy. 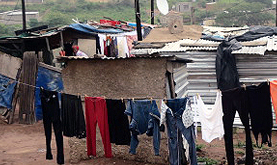 PHAKAMISA works in poor communities and in the informal settlements where homes are shacks with no access to basic services. The unofficial AIDS infection rate in these areas is 1 in 2. AIDS continues to have a devastating effect on the whole social system. PHAKAMISA employs 2 Wandering Teachers (Phakamisa trained) who provide a free education to children living in informal settlements. These children receive a sound education and loving care. Please visit our Wandering Teacher page. 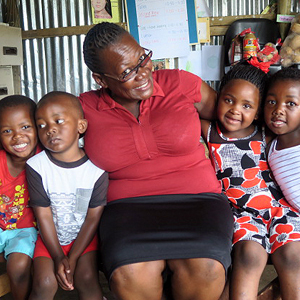 Phakamisa trains 250 educare teachers yearly, enabling 10,000 children to receive a sound pre-school education. 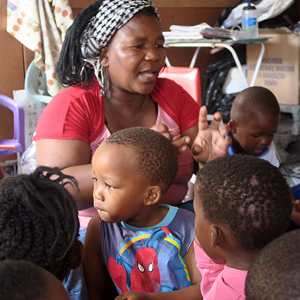 Phakamisa’s wandering teachers provide a free pre-school education to children who live in poverty.